We lost one comics’ greatest creators this past Sunday. Joe Kubert not only touched the lives of those who saw his beautiful work on books like Sgt. Rock, Tarzan and Enemy Ace but one that will continue to shape young comic artists by founding the Kubert School in 1976. RIP and thank you Mr. Kubert for all you did in your amazing time with us. We extend our condolences to his family, friends, students and countless fans. What follows are a few remembrances of the man and his work. I first met Joe in 1987 when I had to show a portfolio to get into The Kubert School. To say I was nervous is an understatement. I wasn’t nervous because I thought I wouldn’t get into the school or over what was in my portfolio. I was nervous because Joe was the one reviewing my work. To me at that time of my life and even now I looked at Joe like a god. He could do no wrong when he put pencil/pen to paper. All I knew of him at the time was his work. Now I was finally meeting the man himself. He had very gracious things to say about my work. I was in his large office at the front of the school where the walls were adorned with his work: just spectacular! The memories I have from him during my time at the school are all good. I can’t forget his stern handshake or when I would see him in the halls where he would always pat me on the back and have something nice to say. I vividly remember the pat on the back because it was so strong I felt like I was going to go flying into the wall nearby. I took to heart every comment about my work he said in class. Who wouldn’t? They were coming from a true master of the craft! Just looking through one of the many comics he produced is an education all to itself. I would see Joe at conventions once or twice a year and he always remembered me and we’d have a nice chat catching up. That is what I’ll miss, seeing him at cons. And of course not being able to see any new work from him as well. STAR SPANGLED WAR STORIES #148 (December 1969-January 1970). I read the story when I was a child, and found it unutterably sad. 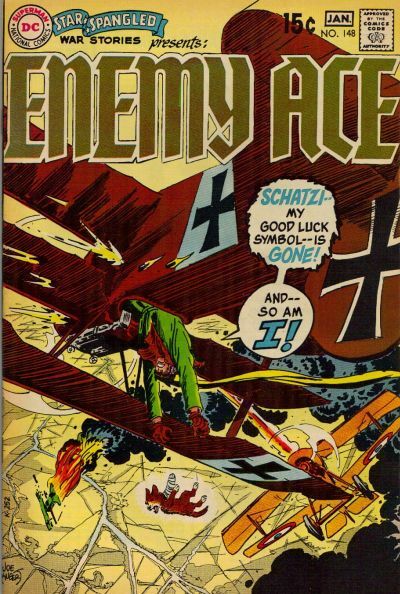 The “hero” was Baron Hans Von Hammer, a World War I German fighter pilot, and I was surprised that American comics could be published about an honorable German warrior. Von Hammer was noble, troubled, and–because of his reputation as an emotionless killing machine–isolated from his fellow aviators. In the story, however, Von Hammer befriends a hapless, wounded puppy he names Schatzi, taking the dog in his plane on bombing raids as a good luck charm. At the conclusion of the story, Schatzi barks to warn Von Hammer of the imminent attack of a UK Sopwith Camel, and in the process of dodging the British plane, Von Hammer tilts his own aircraft enough to spill Schatzi out of the cockpit. The little dog falls to his death. Von Hammer channels his grief into a murderous rampage. The story is “Luck is a Puppy Named Schatzi!” from Star Spangled War Stories #148 (December 1969-January 1970), written by Robert Kanigher and drawn by Joe Kubert. On the occasion of Kubert’s passing, I’ve re-read “Luck” and discovered, predictably, that the story has less of an impact on me now. Because Kanigher yanks at our heartstrings so ferociously, the entire tale threatens to tip into self-parody. In fact, J. Caleb Mozzocco has posted a hilarious retelling of “Luck” on his Every Day is Like Wednesday blog, here. Despite my misgivings with Kanigher’s script, I love Kubert’s art. His cartooning brings grace and ingenuity to perfect and imperfect scripts. Consider the moment in “Luck” when Schatzi tumbles out of Von Hammer’s plane. On the most basic level, the verticality of the panel’s shape emphasizes Schatzi’s fall, and Kubert uses line width to establish the vast distance between Von Hammer in the air and the buildings and rivers on the ground. The shapes at the top of the panel, including Von Hammer and the plane firing behind him, are rendered with spot blacks and thick brush strokes, while the checkerboards on the earth below are delineated with slight, wispy pen lines. Between high and low is Schatzi, weightier–more present–than the ground, but descending into white space, swallowed up by the rapid fall. Von Hammer’s hand desperately reaches out to Schatzi; his index finger is bending at the first joint in an attempt to hook the dog into his grasp. (Like Ditko, Kubert is a master at drawing hands that express character emotion.) Kubert transmutes Kanigher’s scene into an example of graphic virtuosity. Kubert was this good all the time. For Schatzi’s fall and for a thousand other moments: Thank you, Joe. It’s all Joe Kubert’s fault you know. Allow me to explain. 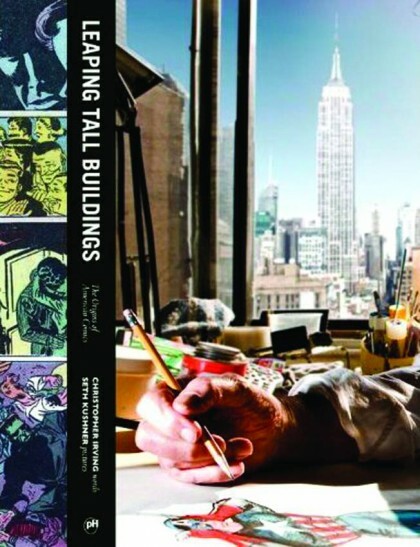 The man has had a legendary career in comics as bothcreator, father and educator. Trying to select the best or most representative piece created by Joe Kubert would beimpossible for most folks, but not for me. It was the 1972– the greatest time for Comics in history (at least for me). Marvel was still flying high and DC had Jack Kirby running rampant in his Fourth World tetralogy, and Neal Adams on Batman and Superman by Curt Swan and Murphy Anderson and all the DC comics were HUGE–$.25 Bigger and Better!! Life was good…. And then it got better… with issue #207 (??!??) DC began to publish Tarzan and it was beautifully written and gorgeously drawn by this guy named Joe Kubert. And thanks to him and that fabulous adaptation of the first two Tarzan novels, I was hooked. 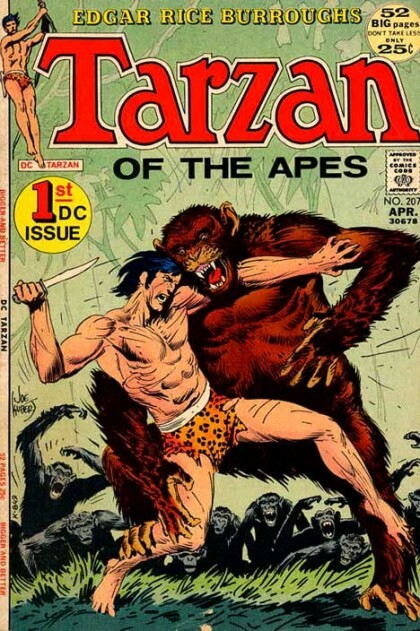 Before Kubert, I thought Tarzan was kind of dumb and I thought the Tarzan movies were both old and dumb. But once Kubert took charge, I got it. Tarzan was a hero like Batman and Orion and I wanted more Tarzan. That desire for more Tarzan never left–it directed me toward Russ Manning’s incredible Tarzan comic strip. This left me wanting even moreso I ended up collecting the entire Hal (Prince Valiant) Foster and Burne Hogarth Sunday page comic runs of ol’ Lord Greystoke. To this very day, I still love Tarzan and always will and it is because of Joe and for that alone, I am eternally grateful. RIP and thanks Joe!! If there’s a single thing about Joe Kubert’s art that will continue to persevere throughout comics history, it must be his versatility. While he’ll probably always be most regarded for his war comics like Sgt. Rock and Enemy Ace, it’s hard to deny his presence in adventure comics (like Tor and Tarzan) and super hero comics as well. While many recognize Kubert’s role in defining the Silver Age Hawkman, it’s worth noting that Joe consistently pushed the boundaries of the medium. Though the character has never been as popular as any of aforementioned ones, Kubert’s Ragman was and still is a relevant figure in the DC Universe. Drawing from his own experiences, Joe created a character that shared many similarities with his own life and upbringing. There were elements of Jewish mysticism and mythology, but also the idea that a hero could emerge from the humblest of origins. Joe later went on to create Yossel, showing that he was also more than capable of exploring autobiographical comics. 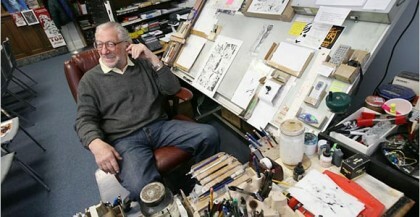 Comics creators and fans the world over are all thinking about Joe Kubert and his family this week. Let’s all take time to celebrate the man, his versatility and the indelible legacy he has left on our industry.